Some people just cannot bring themselves to refrigerate peaches. Storing peaches lovingly at room temperature is said to coax out the best in peach scent, flavor, and texture. But treating peaches this way does take a lot of time and vigilance, as I detail elsewhere. Reliable authorities – peach packing houses and state extension agencies – recommend refrigerating peaches once they become ripe, but some people would rather risk losing fruit to rot than let them get cold. But does it matter? Can peaches be stored in the fridge to slow their decline without compromising their peak? Harold McGee describes fruit ripening as “a drastic change in the life of the fruit that leads to its death.” (On Food and Cooking, 2004, pg 351). Here, the “life of the fruit” is not metaphorical: even after they are picked, peaches and other fruits are still alive. They are living, breathing objects that continue to use their DNA to make proteins and synthesize flavor compounds and aromas. Some of the proteins a peach makes are designed to lead to its own death, a time when cells have lost integrity, metabolism has stopped, and fungi have invaded. The changes that happen between harvest and full ripeness are more dramatic in species like peach, pear, tomato, and banana – all climacteric fruits –than in non-climacteric fruits like citrus and grapes. Climacteric fruits are extremely metabolically active and tend to gain sweetness and flavor and become softer after they are picked, whereas non-climacteric fruits don’t improve much once they are severed from the parent plant. In other words, peaches are out partying their short lives away while grapefruits sit at home hoping to avoid penicillin mold. Temperature is certainly going to influence how all these physiological changes play out during ripening. Plant scientists have learned a lot about the life of climacteric fruit because commercial growers need to control it during shipping. Peaches are particularly prone to becoming mealy and weak in flavor if they are picked firm and stored cold before they are allowed to ripen at room temperature. Since most studies on cold storage have tested fruits at 4 to 5º C, the temperature of a home refrigerator, their results are relevant to the ordinary peach lover. Details follow, but basically, these studies find that chilling unripe fruit for several weeks disrupts the systems and feedback loops that orchestrate fruit ripening and then death. One important system protects the fruit from oxidative damage and another controls the dismantling of the cell wall as the fruit gets softer. Plant scientists are still working out the details, but apparently many other genes are up- or down-regulated in chilled peaches, influencing sugar and acid levels and therefore probably flavor. Peaches, like people, are continuously exposed to oxidative stress that can damage cell structures. In the youthful period before peaches are fully ripe, they are protected from damage by enzymes and other proteins that control ROS (reactive oxygen species). Antioxidants present in the fruit (e.g. vitamins C and E and anthocyanins) also help keep damage in check. Once the fruit is ripe, however, the genes that control these proteins get dialed back, and the ROS are allowed to rampage around in the fruit as part of its planned death. What some studies have found is that chilling turns down the production of protective proteins too early. When the fruits come to room temperature and start to ripen, they are left vulnerable to oxidative damage. Possibly the worst consequence of too much chilling is mealiness. Mealy, or “woolly,” peaches are like sponges, with dry fibrous insides and lots of tiny air spaces. They are not overripe; rather, their maturation has been disrupted. During normal ripening, fruits get softer because cell walls become more pliable and cells separate from each other. Softening is caused by enzymes that loosen the pectins and glycans that reinforce cell walls and bind adjacent cells together. Chilling for over a week or two reduces the levels of some enzymes and disrupts their normal activity even after peaches are brought back to room temperature. As a result, some pectins act as gels that hold on to juice that would normally run out of the cells and onto your tongue. Cells separate from each other in clumps, rather than individually, and they don’t break open to spill whatever juice they still contain. All these studies seem to support the view that unripe peaches should not be stored in the refrigerator at home. But we can’t quite jump to that conclusion without considering the entire life of the peach. On the one hand, your peaches may be fairly resilient. It turns out that peach varieties vary in their responses to chilling, with some fairly resistant to damage. Nectarines – just naked peach mutants – are yet more tolerant of the cold. And even cold-sensitive peaches stay happy with close-to-normal enzyme activity for up to a week of cold storage. On the other hand, you may not know how many days your peaches were in the cold before you brought them home, unless you buy local peaches in season. Additional refrigeration is risky. These studies did not test what happens when we refrigerate peaches that have already become ripe, but doing so does not seem to cause any problems. Packing houses recommend keeping ripe peaches cold if they won’t be eaten right away, and this advice makes sense. At that point in their lives, peach fruit metabolism has dropped, they are no longer improving, and the real concern is slowing their decomposition. What is a dedicated peach lover to do? If the peaches you bring home have not reached their peak, then storing them cold and eating them right out of the fridge probably will rob you of some joy. Peach connoisseurs are right to insist that we allow the fruits to develop their irresistible summer scent before relegating them to the crisper. I must confess that after reading around on this topic, I’ve stopped being so careless with my weekly haul of local stone fruit. The nectarines don’t need extra attention; they were always ripe and fantastic. 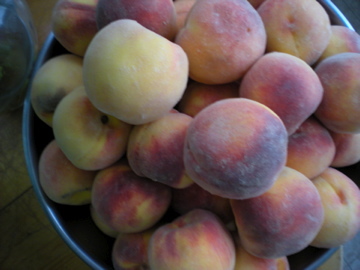 But a day or two on the kitchen table have made the California peaches taste almost – almost – as good as Georgia peaches. Wherever you live and whether or not you fridge, there is no controversy about the beauty of a fully ripe peach. This entry was posted in Fruit, Uncategorized and tagged eudicot, fruit, nectarine, peach, Prunus, ripening, Rosaceae, Rosales, rosid, stonefruit. Bookmark the permalink. I have been thinking about this a lot lately! Doing weight watchers I am now eating more fruit . My favorite season for fruit is the summer . Well, I come to find myself thinking about the fruit(peach, pear ,plums) and wondering if they are still ripening and I am wondering does it continue to ripen in your stomach? At what point does it die? Can a ripening piece of fruit become a problem in our system .And where are these overly overgrown peaches and nectarines and plums coming from lately? That they are selling at 99 cents a pound..Well it was just a thought! Thanks for your questions. It’s true that a peach is still living when you eat it, but the cells get hit pretty quickly with the acids in your stomach. When that happens, the cells die and ripening stops. What does keep going, though, is the dietary fibre. We don’t digest it. Some types of fibre (and some sugars) are digested by the microbes in our guts that are essential for optimal health. Other components (cellulose, for example) are not digested but do bulk things up and keep them moving through. It’s all good! I live in Chicago and virtually all “fresh” peaches sold by grocers here and in the midwest are shipped in refrigerated trucks from California. On display in leading grocery stores they are usually cold or at least cool. What happens when you bring them home. The get mealy, mushy and spoil. The refrigeration dries them out, kills their ripening. What’s the result? THE BIGGEST FRAUD OF THE SUMMER PERPETRATED BY CHICAGO GROCERS. All their peaches look so neat and tasty, but cooled. They never ripen. Some buy them for high prices. Its the perpetual “screw” of Chicago grocers, Alberton’s (Jewel); Mariano’s (Kroger), Treasure Island–all the rest. I agree totally and the same happens to bananas. They look great when you buy them and within a day they are brown and soft. I don’t know if you are still monitoring this thread (and I appreciate the work you put into this); but if you happen to be, I have a question. We have three peach trees at a house we just moved into, all heavily laden with nearly ripe fruit. A recent series of storms have decimated the trees, felling one and breaking the other two to pieces. The peaches are nearly ripe and holding on. I am a baker that works for a brewery – we can use these peaches, and there are probably 20, five-gallon buckets worth on the trees. We have access to cooler space and lots of buckets. The brewers will use them, as will the bakeshop, but I am uncertain as how to best handle this. I need to harvest them due the hordes of yellow jackets that will no doubt descend upon us soon. The trees are very close to the house for some reason. I would like to do honor to the trees and their, perhaps, final efforts. Any help would be greatfully received. I thank you for your time. Thank you for your inquiry, Junebug. Your local Extension folks will probably have better ideas than I do about how to deal with your predicament that is at once horrible and wonderful. My first thought is that you’ll need to get the fruit dry and keep it dry, gently. You’ll need to separate out ripe vs. unripe and undamaged vs. bruised/damaged fruit, and deal with those categories appropriately. I’m afraid that whatever the stage of ripeness, bruised or damaged fruit will rot quickly and should be dealt with (triage removal of bruises and damaged sections; refrigeration; cooking/freezing) first. You may need to explore creative culinary or brewery uses for relatively unripe damaged fruit. Pickles? Chutney? Jam? Peach butter? Peach pit/skin liqueur? If you can gently dry off undamaged but unripe fruit and keep the individual fruits from touching each other (non-plastic barrier in between them), they will likely continue to ripen if kept at room or outdoor temperature. I don’t know if plastic buckets are the best way to store them to ripen, but maybe it would be fine if you lined the buckets with some combination of paper and towels. Don’t refrigerate the undamaged fruit until they’ve reached the ripeness you desire. Hopefully in addition to buckets and coolers you also have access to some decent freezer space, as I suspect that a large amount of frozen ripe peaches may be in your near future! Good luck. And if you haven’t read Katherine’s latest essay on peaches, please do so. Good luck! Yes, thanks for your inquiry. Jeanne’s answer is perfect, and mine will be shorter as I’m on the road. I will simply add that you might consider drying the ripe or even nearly ripe ones. You can still brew with them. I was in southern Illinois for the eclipse and had dinner at Hedman’s Vinyards in Alto Pass Illinois. They had a terrific dessert wine (technically brandy?) made from local dried peaches. I suppose they rehydrated them to start the fermentation. I find that drying peaches corrects many flaws, and I love adding them to oatmeal on dark February mornings!